Just ahead of the weekend a rumour surfaced concerning AMD using GDDR6 as the memory installed alongside an upcoming range of GPUs. The source of the chitter-chatter was the LinkedIn profile of a principal member of AMD's technical staff, Daehyun Jun. Under Jun's most current experience description was an entry that said he was working on a DRAM controller for GDDR6 memory. The entry remains but the 'GDDR6' has been scrubbed out. Micron, SK hynix, and Samsung released news regarding their GDDR6 development and production this year. The latest news we have is that Micron will being mass production of GDDR6 early in 2018, and SK hynix might have already started shipping two types of 8Gb GDDR6 SDRAM (14.0Gbps and 12.0Gbps) to manufacturers by now. As we revealed about a year back, GDDR6 will offer approx twice the bandwidth of GDDR5, offer greater efficiency, and reduce the burden and complexity of designing new graphics cards based upon GDDR5. In basic numerical terms GDDR6 could achieve approx 16Gbps when it becomes widely available, up from the 11Gbps bandwidth of Nvidia's GeForce GTX 1080 Ti with its GDDR5X memory tech, for example. 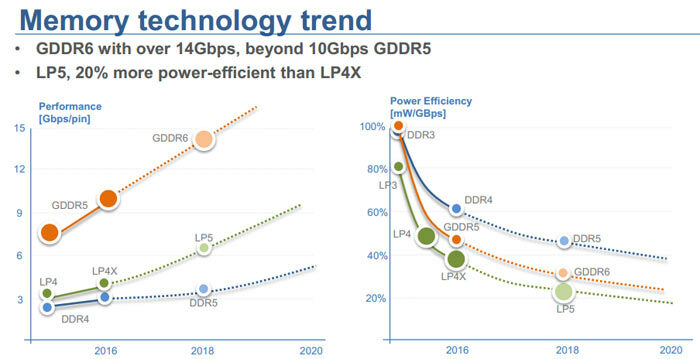 We've seen AMD GPU roadmaps featuring various generational products but none so far have mentioned GDDR6. 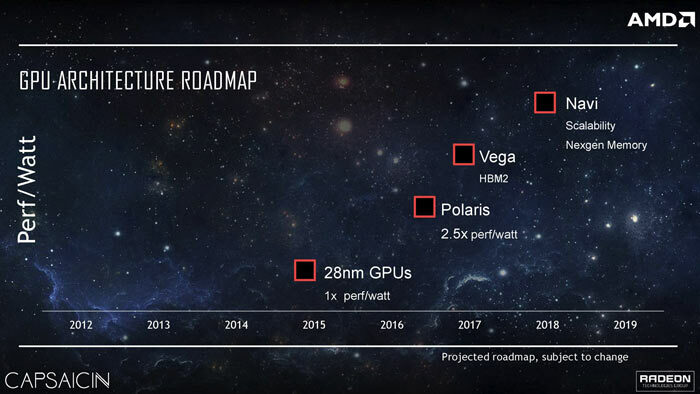 The roadmap we see most often, reproduced below, shows the progress from 2015 to 2019 and includes the mention of HBM2 and 'Nexgen Memory' but that is all. So what products might use the GDDR6 graphics memory? While AMD's halo products might come packing advanced architectures and memory types one might expect a follow up to the Polaris line to adopt GDDR6. It could arrive with the RX 600 series of graphics cards next year. Nvidia has done well in the enthusiast / gamer segments with GDDR5 and GDDR5X, so GDDR6 might be all that's needed for next year's mass-market GPU updates from both camps. Nvidia intros GeForce GTX 1650 GPU Asus Nvidia GeForce GTX 1650 Ti graphics cards listed by EEC 50th Anniversary Ryzen 7 2700X CPU bears Lisa Su's signature Samsung postpones Galaxy Fold consumer launch Has Samsung been chosen for Intel Xe GPU manufacturing? I think it's safe to say AMD want to move away from HBM as quickly as possible. It's been a complete disaster for their GPU's. Good technology but it just wasn't ready for mainstream in the quantity needed at the price required for the home GPU market, and ultimately, not much better than the latest GDDR offerings. And yet Intel are giving it a go, and Nvidia use it in their high end server parts. I think HBM2 makes most sense in an APU - the alternative is using DDR4 system RAM, and the bandwidth limitation that entails. There just wouldn't be space on the CPU package for multiple GDDR dies. Last time I briefly looked up GPU, I saw a lot of posters expecting big thing from HBM2, some even saying that they are holding back for it. No longer then case then? the problem of HBM is not the supply or fabrication tech but an issue of demand, the demand is just not good enough.